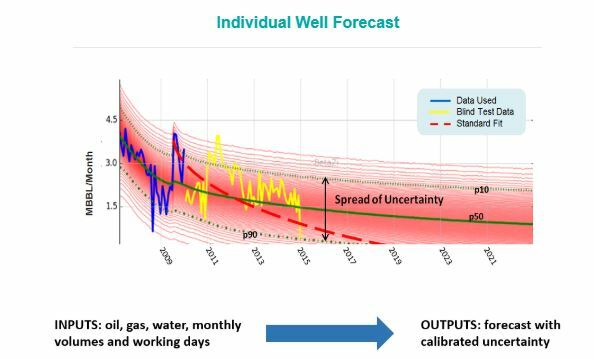 BasinAlphaTM, powered by BetaZiTM production forecasts and TGS data, is a physics-based predictive analytics solution that computes unbiased, accurate, automatic production forecasts with calibrated uncertainty using TGS high-quality well data. 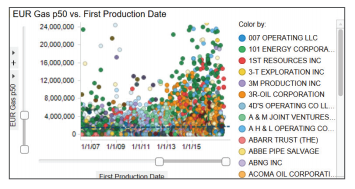 This powerful tool is used for evaluating basin-wide production data to provide actionable insights to focus an asset acquisition team on the most profitable areas and companies in an area of interest. 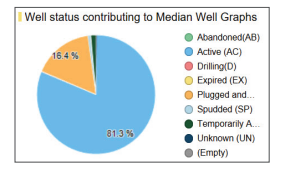 TGS and BetaZi have jointly produced a series of pre-computed, comprehensive studies based on BetaZi ’s probabilistic well forecasts and informed by TGS’ high-quality data for every well in a basin. With BasinAlpha you gain deep basin knowledge in minutes, for informative and strategic decision making. 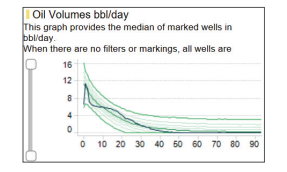 BasinAlpha is the world's most disruptive oil and gas production forecasting and type curve analysis technology, based in 21st-century computer science. BetaZi's groundbreaking, physics-based algorithm uses artificial intelligence and statistical methods to generate and synthesize forecasts to produce accurate reserves estimates and asset valuations. BasinAlpha artificial intelligence learns production behavior and feeds diffusion physics model that calculates/synthesizes accurate forecasts. Synthesized forecasts feed traditional MCMC outputs and calculate economics. Learn more about how BasinAlphaTM leverages the power of physics-based, big data predictive analytics.